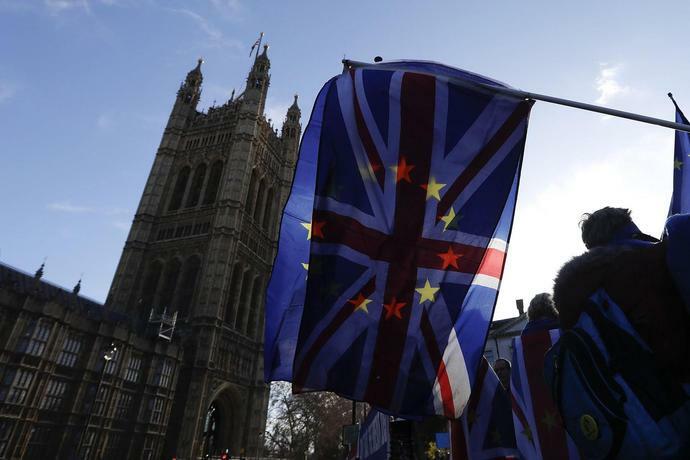 (Bloomberg) -- Theresa May is seeking to buy time to renegotiate her Brexit agreement with the European Union, as her opponents in Parliament plot to take control to stop the U.K. plunging out of the bloc with no deal. She'll make a statement in the House of Commons on Tuesday. "Has she got the message?" Dromey said in an interview. "We can't go down the path of no-deal, we can't allow the continuing drift towards the cliff because if the country falls into the abyss the consequences will be catastrophic." Other potential amendments are also on hold until after May's statement. The prime minister, who held meetings with members of Parliament on Monday, will update the House of Commons on Brexit talks and outline what will be in the government's motion scheduled to be debated by lawmakers on Thursday. "We are determined to organize via this accord an orderly exit" of the U.K. from the European Union, Michel Barnier, the bloc's chief Brexit negotiator, told reporters in Luxembourg. Barnier warned that time is running short for negotiations, and reiterated the EU's position that the so-called Irish backstop must remain in the divorce deal as an insurance policy to prevent a hard border after Brexit. The companies that run the Channel tunnel are suing the British government over its award of ferry contracts to handle freight shipments in a no-deal Brexit, just days after the 13.8 million-pound ($17.8 million) contract with Seaborne was scrapped when it became clear the company -- which doesn't own any ships -- wouldn't meet its requirements. Channel Tunnel Group Ltd. and France-Manche SA accuse the government of a "secretive and flawed procurement exercise" for the backup ferry service in the event of a no-deal Brexit, their lawyer Daniel Beard said in court Monday. The companies together form Eurotunnel, which operates the link between the U.K. and mainland Europe. Defence Secretary Gavin Williamson's speech earlier laying out his global Britain vision -- in particular his argument that Brexit could "enhance the U.K.'s lethality'' by boosting the U.K.'s global standing against threats from Russia and China -- has drawn a swift response from opposition lawmakers. "The idea that our membership of the European Union restricts us is the purest nonsense," Labour lawmaker Chris Leslie said. "You don't have to know much history to know why Europe is and will remain central to our military posture, or that co-operation and peace in Europe is what allows us to invest in global strength." In her letter to Jeremy Corbyn over the weekend, Theresa May stopped short of fully rejecting the Labour leader's demand for the U.K. to stay in a post-Brexit customs union with the EU. But her spokesman, James Slack, moved quickly on Monday to dispel talk there may be some wiggle room on the issue. "We're not considering Jeremy Corbyn's customs proposals, we're not considering any proposals to remain in a customs union," Slack told reporters in London. "We must have our own independent trade policy." One effect of that will be lawmakers on both sides of the House having more time between hearing May and deciding what amendments to propose on the government's Brexit new motion -- which is has not been published -- ahead of the votes on Thursday. What do Nike and Google have in common? Both faced European Union (EU) antitrust fines in March - $14 million for Nike, $1.7 billion for Google. Volatility in the currency has fallen to the lowest in years and options markets signal there are fewer bets against sterling after Prime Minister Theresa May gained a six-month reprieve from the European Union to try to agree a way forward. The pound has been one of the worst performing Group-of-10 currencies against the dollar and euro in the past month, yet remains the biggest gainer in 2019 after a strong start to the year on expectations of a Brexit deal. May's talks with the opposition Labour Party are continuing as she tries to get approval for the divorce terms from a divided House of Commons. US-EU trade conflict However, a new trade conflict between the United States and the European Union is emerging following the World Trade Organization rulings against Boeing and Airbus. According to the WTO, both companies have been receiving illegal public support. First, the US threatened the EU to impose sanctions, and now the European Commission is doing the same.